Busy Bees Soccer Activity for U4-U10: Lots of Touches, Lots of Fun! Busy Bees: Great game to get everyone moving and touching the ball! Applicability: Great warmup activity for the beginning of practice because all of the players are moving around with a ball, changing direction and pace…and it’s fun! Area: 20 x 20 yards (W x L). Have the players “BUZZ” around like a bunch of bees (get them to make the noise!). Make sure you pretend to hear the bees and begin saying that you don’t like bees. 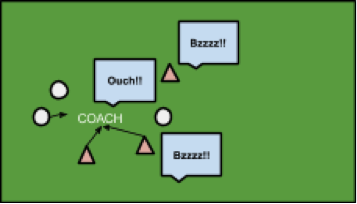 Have one of the Assistant coaches kick you with the ball and you fall down and yell “Ouch the bee stung me!” Be very dramatic and the kids will begin stinging you with their ball. Make sure you move around and stop frequently. They really love this game. Ask if anyone wants to be the beekeeper (your role) and continue the game (go for 30-45 seconds max) and allow all players to have their turn as the beekeeper. With the older groups and larger numbers, you may need to start with two beekeepers. How can you look at the ball and the beekeeper at the same time? Should we take big touches or little touches (depends, but the rule of thumb is little touches to maintain better ball control). What part of your foot can you use to “sting” the beekeeper (any, but more likely they will use toe, laces, and/or side of foot). Mandate that players can only use one foot to dribble the ball (e.g. right foot only). Mandate that they can only “sting” the beekeeper with one foot only. Make it a competition to see who can get “sting” the beekeeper the most in a 30-45 second period. Get that person to demonstrate how they are able to get so many stings, and then see if the other players can imitate them. Do You Know What is Developmentally Appropriate for U10 Rec Soccer Teams? Awesome! I will definitely be adding this to the list of games for our next practice. We have played an “ouch” game before and our U6 players loved it. This version sounds far more entertaining. Thanks for the suggestions!